BODYWEATHER DISTILS TIME. AS A PRACTICE, IT WORKS TO OPEN THE LINE OF CONSCIOUSNESS BETWEEN PERFORMER AND PLACE. IN ITS TRAINING METHODS, PLACE AND BODY BECOME MUTUALLY ALIVE: THE BODY STARTS TO ‘CHANNEL’ A PLACE WHILE PLACE IS INHABITING, AND BREATHING THROUGH, THE BODY. WHEN REFINED FOR PERFORMANCE, BODYWEATHER [A PRACTICE INITIATED BY JAPAN’S MIN TANAKA] BUILDS A STAGE POETICS OUT OF RECALLING EMBODIED ENVIRONMENTS. WHILE THE TRICK SEEMS TO SIT IN THE PERFORMER’S ABILITY TO USE, BUT ALSO TRANSCEND, PURELY INTERNAL STATES, SUCH PERFORMANCES OFTEN FOCALISE THE MINUTIAE OF EXISTENCE ITSELF: THE EDGE OF AN ELBOW, TWO CONCAVE FEET, A PAIR OF EYES LOOKING OUTWARDS THEN INWARDS THEN OUTWARDS AGAIN. STILLNESS. SLOWNESS. PERCEPTIVITY. 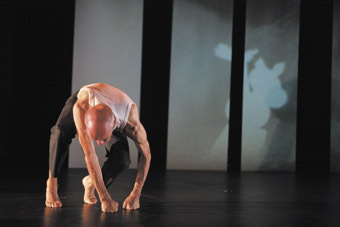 In Borderlines (Linda Luke), the body charts a path of slow awakening. Beginning flattened in darkness, this body takes at least 10 minutes to stand itself upright. Slithers of light (designer Travis Hodgson) help us to read this slowly clambering, half-flaccid body, by plotting small rectangles that gradually grow in dimension across the space and skin. Are these peepholes—is this a game between us and performer? Or are these metaphors of a body broken? (Half-hidden, the body doesn’t seem to comprehend itself as a complete form.) Or do we simply see an image of night breaking, dawn being drawn inwards through blinds, a stiff morning caterpillar body shuddering towards yet another day? In its abstraction Borderlines plays structurally with the body in regimented space. The dimensions of the body are plotted in movements that grow in rhythmic and spatial ascension. Small twitches indicate a kind of paralysis. Soon, this rigidity is softened with the extension of limbs and the slow illumination of a tense red borderline (a diagonal cord) within the space. Luke dresses in red gumboots to play out a motif of childhood hopscotch—a game of boundaries that is repeated when she is entangled with elasticised cord in a dance of frustration: there is little release when it finally snaps unhinged across the room. Meantime, her shadows have been flapping, enlarged, on the sidelines—monstrous dopplegangers of an inner self wanting to break free. In Tarkovsky’s Horse (Peter Fraser), moments of theatricality undercut the intensity of pure bodyweather action. Walking on invisible gridlines, this body is loose at the joints, its head wobbling in somnambulant reverie. Punctuating the piece with nostalgia, Fraser is framed by a scratchy projection of grasslands (video Sam James). As an homage to Russian film director Andrei Tarkovsky, this body seems immersed in the texture of film itself. Tarkovsky was well known for his long takes and scenographies of childhood beauty. Such themes of re-birth and reminiscence appear when Fraser takes on the guise of a newborn foal—clumsy, clambering on all fours, but trying to ambulate. There is some relief in this image: it is readable beyond mere internality. Other motifs likewise serve to break the abstraction of form—a rehearsed laugh and steady recorded audience applause; moments of looking at us, his watchers. Both Borderlines and Tarkovsky’s Horse rely on sound composition (and Tarkovsky’s Horse also on video) to explicate the textures that performer bodies present. Michael Toisuta works live with Linda Luke to embellish the halogen hums, clock ticking and pop-flutey tones of rhythmic modernity with dulled screeches of electro-acoustic feedback. This improvised score of extended and manipulated strings amplifies a world that is at once haunting and exciting: the body is poised in a place of curiously warm isolation. In Tarkovsky’s Horse, Natasha Anderson uses the echolalia of computerised bubbles to evoke a mindstate of nostalgic lightness. The bubbles fizz, pop and turn into a gurgling percussive rumble that is overwhelmed by a loose viola slipping and sliding down chords. Borderlines and Tarkovsky’s Horse offer visions of bodies in tension with their environments. For Luke this is a stiff, geometric tension placed against an unlocatable backdrop. For Fraser, this is an almost romanticised tension between the body and its sense of a former wholeness. We sense it longs to climb back into some warm womb. Both Luke and Fraser draw a murky line between the training practices undergone as part of the research for these works and the craft in (re)performing the works themselves. In this, they depict an internalised focus that is at once commendable and alienating, creating a performance state that is compelling, if difficult to puncture.